You would like to create a business gift certificate that you can use to keep customers coming back to your business and to help your current customers share your business with those who are a part of their lives. You will find that this Business Gift Certificate Template will help you create just what you want to create. 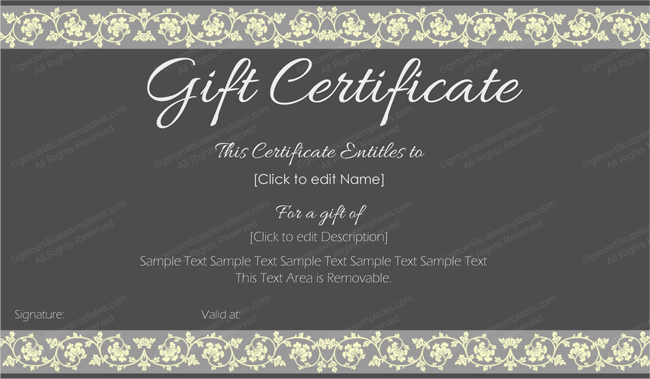 With a professional designed that is edged with a floral pattern, the gift certificate created with this template will stand out. This template includes space for you to fill in the name of the one who will be receiving it as well as just what it is that the gift certificate is good for. If you are looking to create a gift certificate for your business and you want to make sure that what you create is fully professional and easy to use, you will find this Business Gift Certificate Template will work out well for you.